Jeff VanderMeer [vanderworld at hotmail.com] has been involved in the publishing industry from almost all perspectives for more than 25 years as fiction writer, book reviewer, editor, publisher, publicist, teacher, and creative consultant. In that span, he has had novels published in fifteen languages, won multiple awards, and made the best-of-year lists of Publishers Weekly, the San Francisco Chronicle, the LA Weekly, and many others. His award-winning short fiction has been featured on Wired.com’s GeekDad and Tor.com, as well as in many anthologies and magazines, including Conjunctions, Black Clock, and in American Fantastic Tales (Library of America), edited by Peter Straub. His nonfiction has appeared in the New York Times Book Review, the Washington Post, the Barnes & Noble Review, the Huffington Post, and hundreds of others. He is a regular contributor to Amazon’s book blog. In addition, he has edited or co-edited more than a dozen influential fiction anthologies for, among others, Bantam Books and Pan Macmillan. On the pop culture front, VanderMeer’s work has been turned into short films for PlayStation Europe and videos featuring music by The Church. His latest novel features a soundtrack by Americana rock band Murder by Death. With his wife Ann, he has lectured, conducted master classes, and given workshops all over the world, including at the Brisbane Arts Center in Australia, the University of California at San Diego, and Wofford College, in South Carolina. He is a frequent guest of conferences around the world, including such events as Utopiales in France, the Bumbershoot Festival in Seattle, the Brisbane Writers Festival in Australia, Finncon in Helsinki, and the Walker Arts Center in Minneapolis. 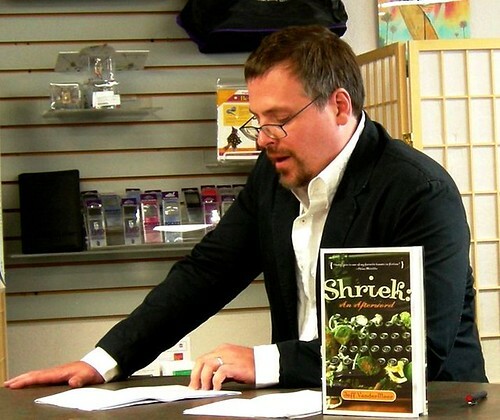 VanderMeer currently serves as the assistant director of the Shared Worlds writing camp for teens, based at Wofford College in South Carolina. VanderMeer lives in Tallahassee, Florida, with his wife Ann, an award-winning editor. For more information, visit his blog. Matt Staggs has been a creative consultant and publicist for many years, in addition to writing reviews and articles for newsstand magazines. As the founder of Deep Eight LLC, Staggs’ work for high-profile indie presses has included facilitating appearances by writers on platforms from the NYT book blog to interviews for Wired.com. His thoughts on new media and other subjects are an integral part of Booklife He can be reached via email at mattormeg at gmail.com.